Judges from the high courts and district courts of Nepal, prosecutors, court officers and officers from the Attorney General’s Office and members of the Commission of Investigation on Enforced Disappeared Persons (CIEDP) recently attended a ‘Workshop on International Humanitarian Law (IHL) for Judges, Prosecutors and Court Officers’ organised by the ICRC in Kathmandu 23-24 March in collaboration with the National Judicial Academy (NJA). 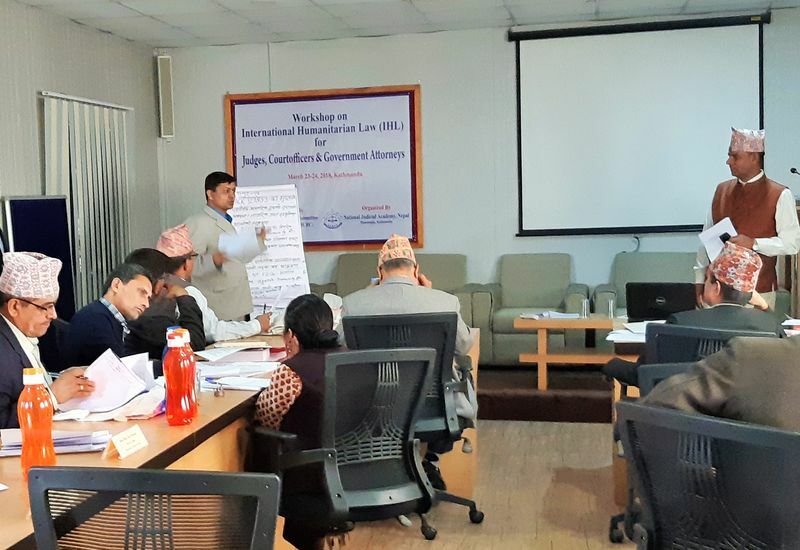 Calling this initiative a continuation of the collaboration between the NJA and the ICRC to sensitise Nepal’s judiciary on IHL, Honorable Keshari Raj Pandit, executive director of the NJA, said the country is still in the “conflict management phase” where the judiciary has an important role to play. Experts from the ICRC, the government of Nepal and law institution of Nepal, along with the faculty of the NJA, conducted sessions on a range of topics which included not only IHL and the work of the judiciary, but also application of international law in Nepal and repression of serious violations of IHL at the national and international level. As part of the workshop, a panel discussion on ‘Transitional Justice in Nepal and the Role of the Judiciary’ was moderated by Honorable Keshari Raj Pandit. Representatives from the twin commissions on transitional justice — the Truth and Reconciliation Commission (TRC) and the Commission of Investigation on Enforced Disappeared Persons (CIEDP) — shared their work progress, respectively, during the discussion. With an objective of providing practical knowledge on different aspects of IHL, a case study was developed for the participants who worked in groups to identify the classification of the situation, crimes, modes of liability and ICC admissibility and jurisdiction based on the case. André Paquet, the head of the ICRC mission in Nepal, said that the ICRC is tackling the remaining humanitarian issues related to the past armed conflict in Nepal. He added that the ICRC is in contact with the government and the conflict-victim associations to advocate and support on issues related to the law and the needs of the conflict victims as part of the humanitarian aspect of transitional justice. “In addition, the ICRC is contributing to building further the capacities of the government, which includes the necessary guidelines and procedures of the forensic sector,” added Paquet. The ICRC and the NJA have been jointly organising the IHL workshop exclusively designed for the judiciary of Nepal since 2016.